Heat oven to 425°F. Spray 8-inch square (2-quart) glass baking dish with cooking spray. In large bowl, stir sauce mix (from potato mix box), chili powder, boiling water and butter with whisk just until butter melts. 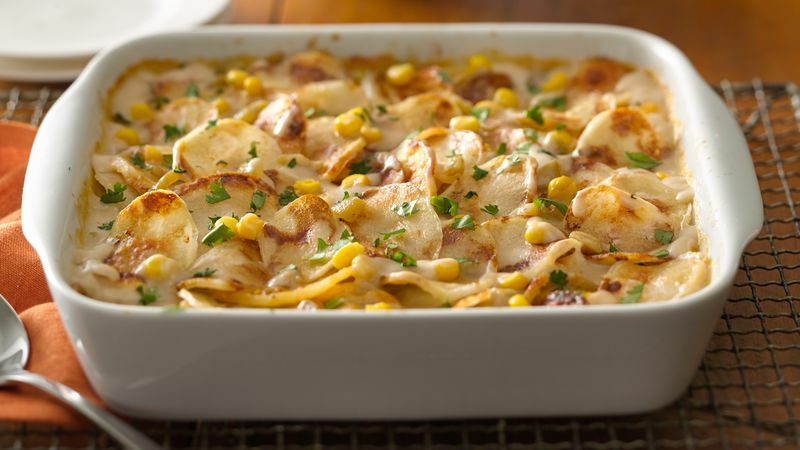 Stir in milk, potatoes (from potato mix box), green chiles, frozen corn and cheese; mix well. Pour into baking dish. Bake 15 minutes; stir. Bake 15 to 20 minutes longer or until top is golden brown and potatoes are tender. Stir; top with cilantro. Don’t have frozen corn? Use 1 cup of canned corn, drained, in place of the frozen. Try with other cheeses, such as shredded Cheddar, Mexican blend or Monterey Jack.